45 Year old Amy Smith, sits with her lawyer in Judge Ernie McClendon's 258th District Court in Livingston on December 8, 2016. Driver is Found Guilty of Intoxication Assault, LIVINGSTON, December 9, 2016 - A Polk County Jury handed down a verdict of guilty to a driver (45 year old Amy Lenora Smith, of Lufkin) for intoxication assault for the April 2014 wreck that left driver 24 year old Michelle Warren, of Lake Jackson with a pain filled road to rehabilitation and recovery. 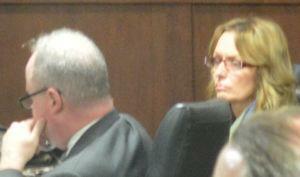 When asked by prosecutor, Kari Allen, on a scale of 1 to 10 how bad was her pain, Warren stated "150". Warren stated from the witness stand that she had to relearn how to walk, stand, and sit. Warren stated that she lives in pain and she's constantly shaking and that her legs shake when she walks, "I'm 27 years old and feel like I'm going on 80", Warren stated from the witness stand. During closing arguments, Assistant D.A., Kari Allen, pointed out to the jury that Smith was south-bound in the north-bound lanes of traffic when the accident occurred, and, that a blood test showed that Smith's blood alcohol level was .18 (twice the legal limit) when the accident occurred. The jury handed down a sentence of five years probation to Smith. The charge carried a possible sentence of 2 to 10 years in prison.